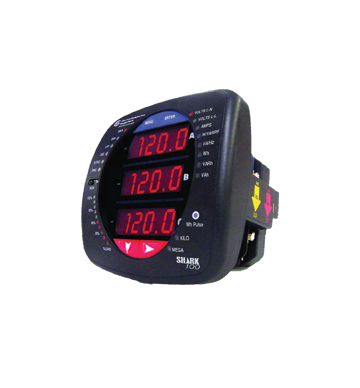 A family of multifunctional power/energy meters with a wide-range of options. The Shark 100 models offer a variety of measurement options and communications. The unit utilizes high speed DSP technology with high resolution A/D conversion to provide revenue certifiable accuracy for Utility Billing, Substation Metering, Submetering and Critical Metering applications. The meter uses 24-bit analog-to-digital conversion sampling at 400+ samples per cycle, providing high accuracy throughtout the measurement range.